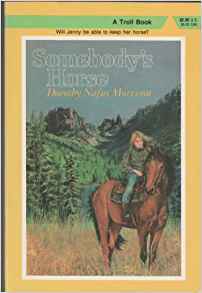 Somebody's Horse by Dorothy Nafus Morrison is my favorite book! Jenny Alexander's parents have promised she can spend the summer taking jumping lessons on Cinnabar at the local stables but a last minute trip comes up and her plans disappear. Then her cousin finds an abandoned horse at her new house and invites Jenny to spend the summer with them. By surprise she finds that her new horse Farfalla is a jumper but surely he belongs to somebody. The book is hard to find, it was written like twenty years ago but it's so good. So if you can find it at the library, definitely check it out! I've never heard of this book but I want to read it now! I love jumping so I am sure I'll like this book.